Britain should become a more Christian nation, according to Baroness Warsi, the only Muslim member of the Cabinet. Lady Warsi, who is also co-chairman of the Conservative Party, said the Government wanted to create a country where people were not embarrassed to say they believed in God or attended church. Writing in today's Daily Telegraph, she says: “We need to create a country where people don’t feel like they have to leave religion at the door. That means being proud of Christianity, not downgrading it. It means encouraging people to say that their faith inspires what they do. 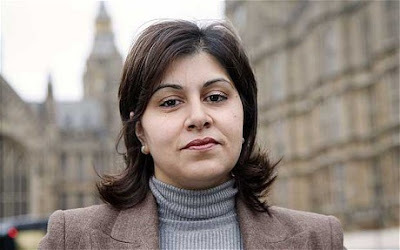 Lady Warsi said it was a “mistake to assume that you compromise your identity the more you try to understand others”. “The stronger your understanding of your neighbour, the stronger your own religious identity becomes. “For many years, I have been saying that the stronger we are as a Christian nation, the more understanding we will be of other faiths.